The CH327 is a rectangular dining table from Carl Hansen that was conceived by the danish designer Hans J. Wegner in 1962. The table is made of hardwood slats that run the entire length of the table. Compared to tabletops whose boards are aligned with the width of the table, this version is much more difficult to produce - but results in a more harmonious surface. Thanks to the tapered edges of the legs, the table appears very lightweight and has a classic, minimalist Scandinavian charm. This also makes it possible to introduce the table into any style interior to serve as a dining table, desk or conference table for meetings. Measuring 190 x 95 cm, up to 8 people can be seated at the CH327 table and can dine, sit together or have a discussion. On demand, the CH327 dining table is available in other types of wood, oiled, lacquered, soaped or treated with white oil. 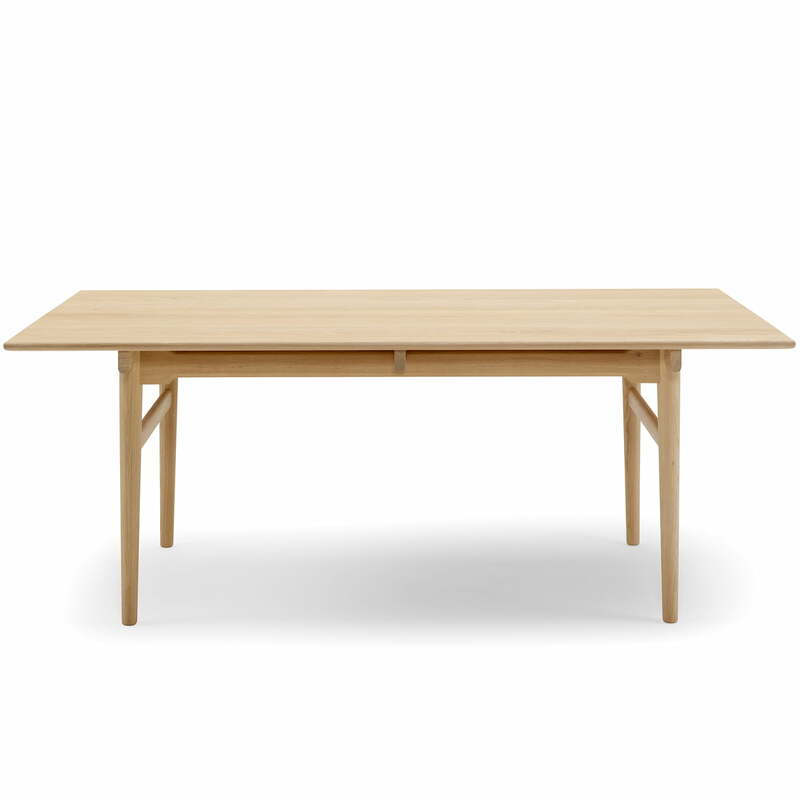 Isolated product image of the Carl Hansen - CH327 Extendable Dining Table, 190 x 95 cm, soaped oak. The table is made up of solid wood slats that run the entire length of the table. 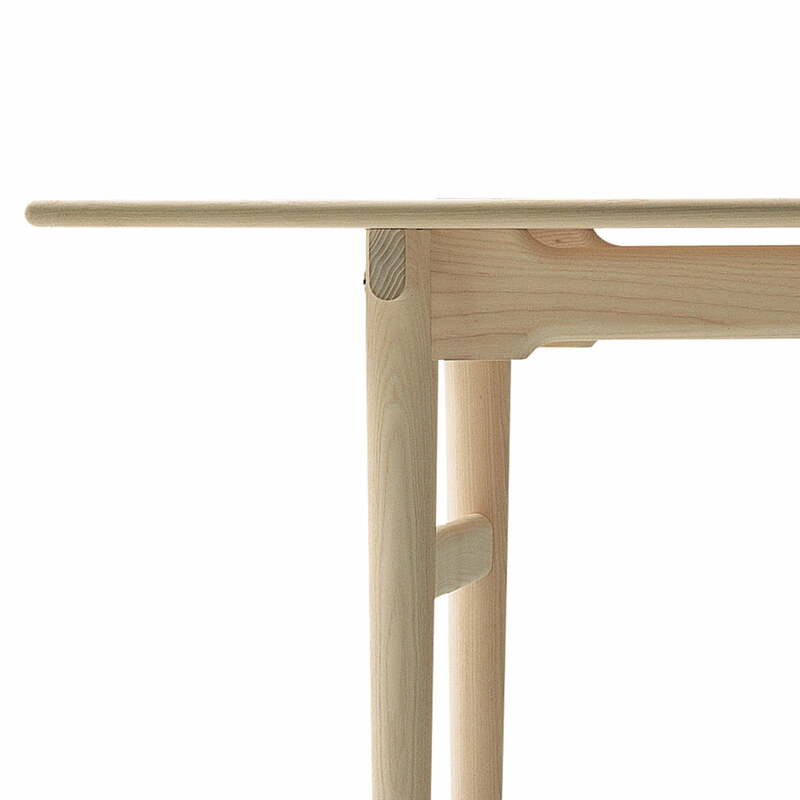 Isolated product image of the Carl Hansen - CH327 extendable dining table. The CH327 is a square dining table by Carl Hansen that was conceived by the danish designer Hans J. Wegner in 1962. The table is made of hardwood slats that run the entire length of the table. 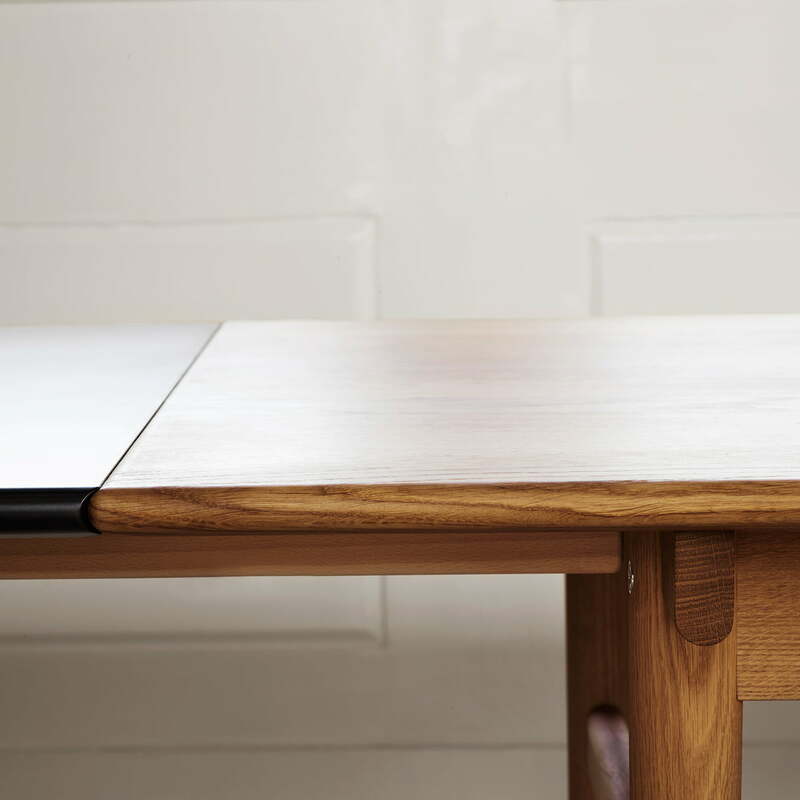 Isolated product image of the Carl Hansen - CH327 extendable dining table. Thanks to the tapered edges of the legs, the table appears very lightweight and has a classic, minimalist Scandinavian charm. 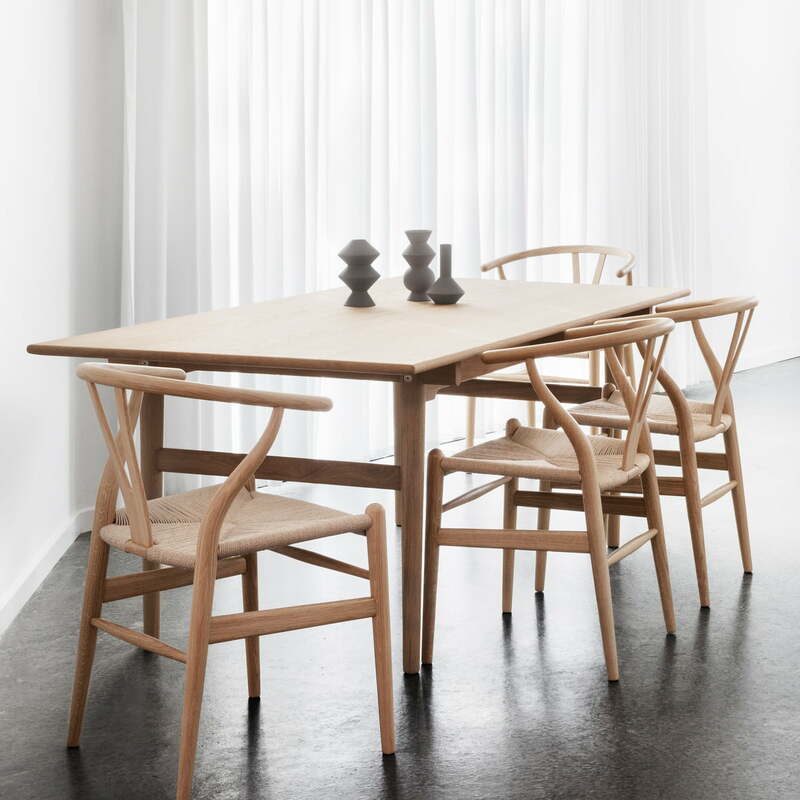 Lifestyle product image of the Carl Hansen - CH327 dining table with CH24 chairs. 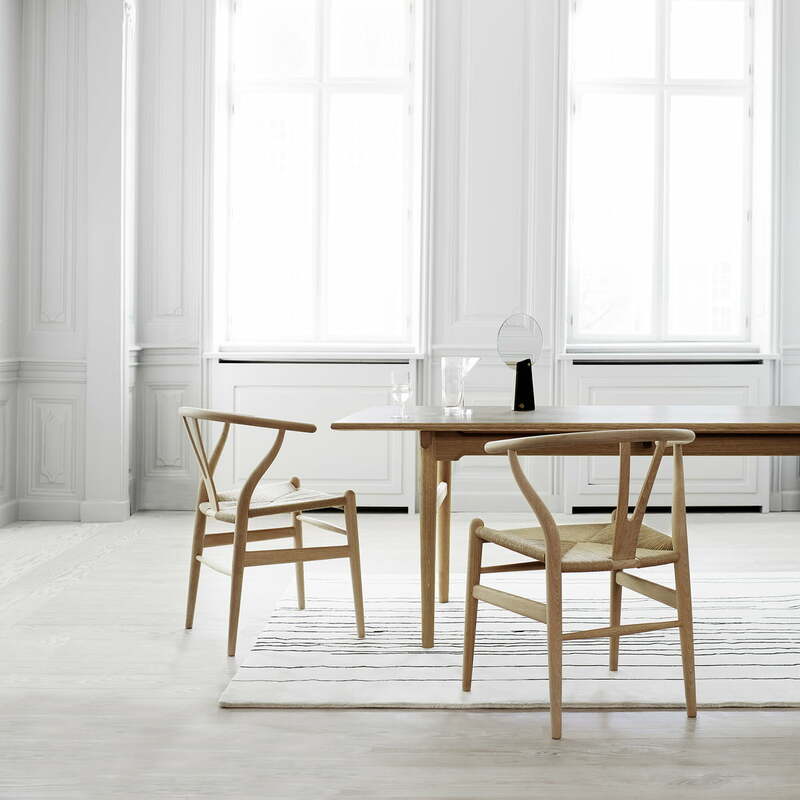 The table fits perfectly into any environment and can be complemented by the matching chairs by Carl Hansen. 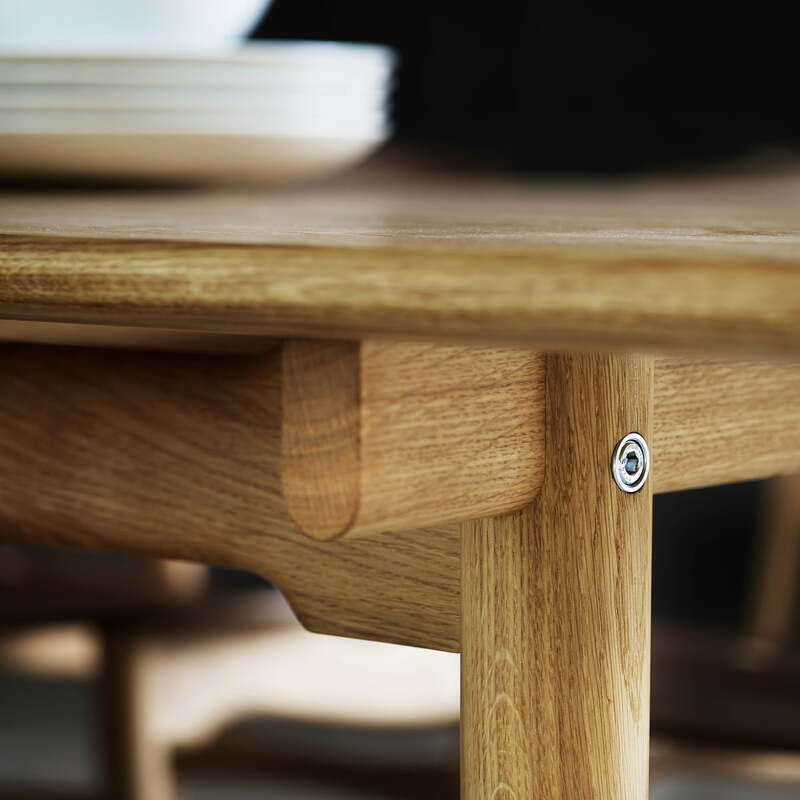 Detail product image of the Carl Hansen - CH327 extendable dining table. The table stands out through its high quality workmanship and refined details. Lifestyle produt image of the Carl Hansen - CH327 dining table with optional leaves. Thanks to the optional leaves, the dining table is easily and quickly extended at will. Lifestyle product image of the Carl Hansen - CH327 extendable dining table. The combination of straight and curved edges provides a great effect and makes it a special piece of furniture. 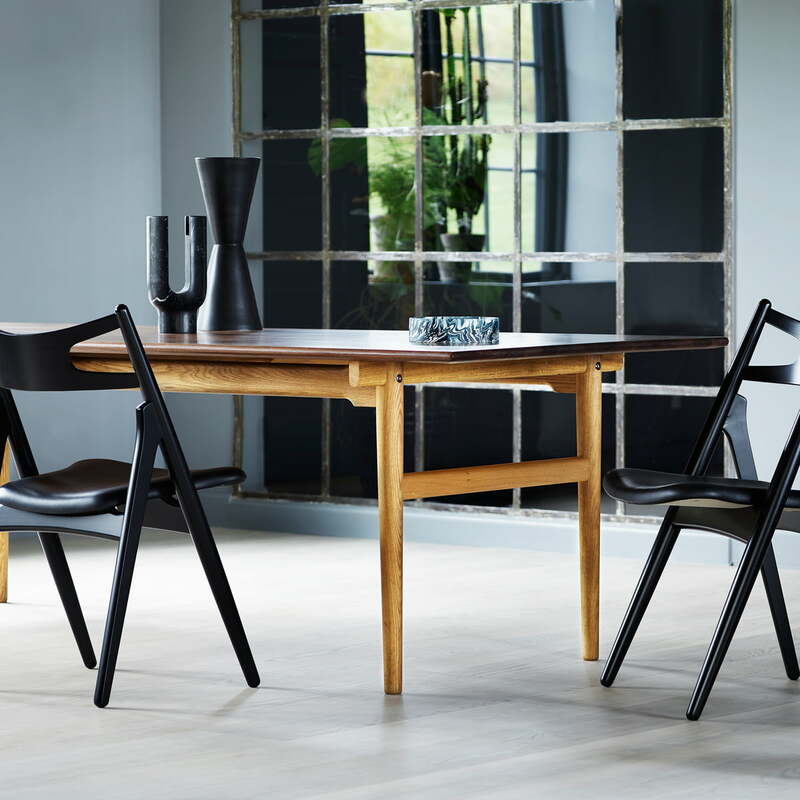 The Carl Hansen - CH327 Extendable Dining Table with CH24 Wishbone Chair. 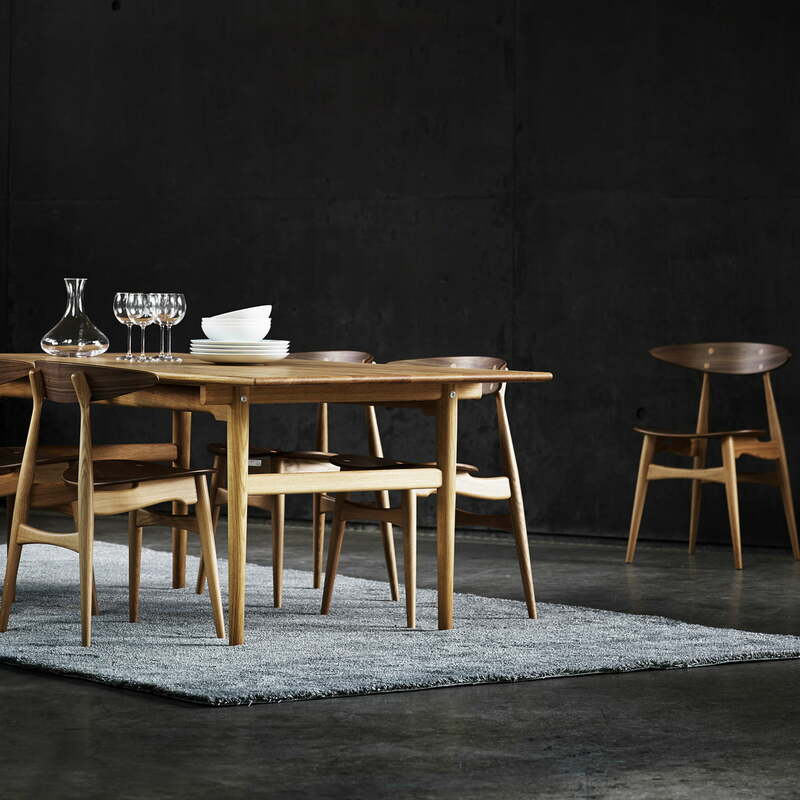 Lifestyle product image of the Carl Hansen CH327 dining table with CH24 Wishbone chairs. Measuring 190 x 95 cm, up to 8 people can be seated at the CH327 table and can dine, sit together or have a discussion. Lifestyle product image: The Carl Hansen - CH327 Dining Table Simple, natural and featuring intricate details, the CH327 dining table stylishly enhances every dining room. The Carl Hansen - CH327 Dining Table with Elbow Chair. 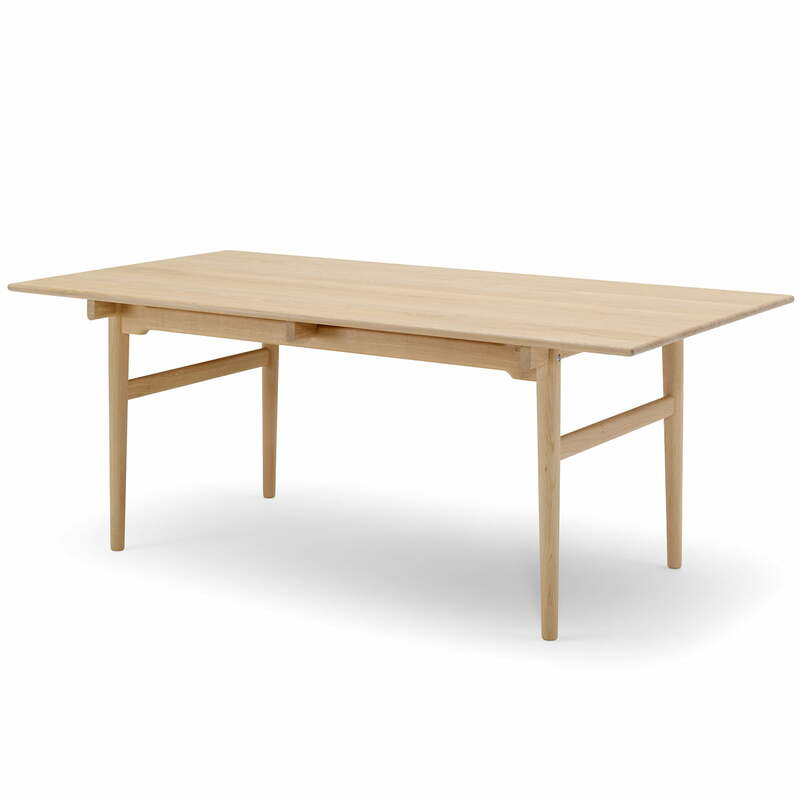 Lifestyle product image of the Carl Hansen - CH327 extendable dining table. Together with the Elbow Chair, a natural ensemble that fits into any interior style is created. 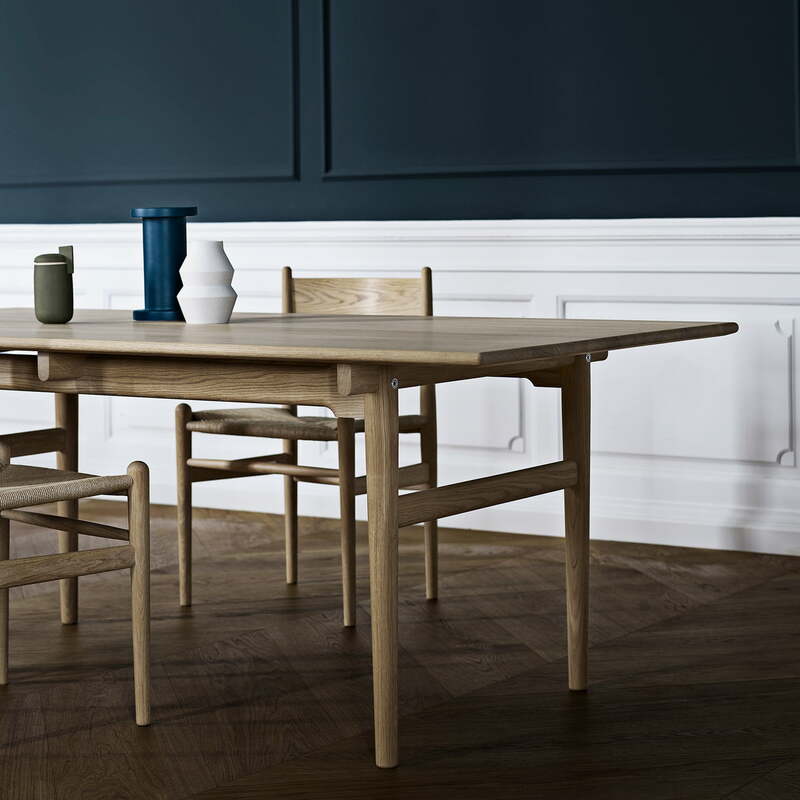 Lifestyle product image of the Carl Hansen - CH327 extendable dining table. 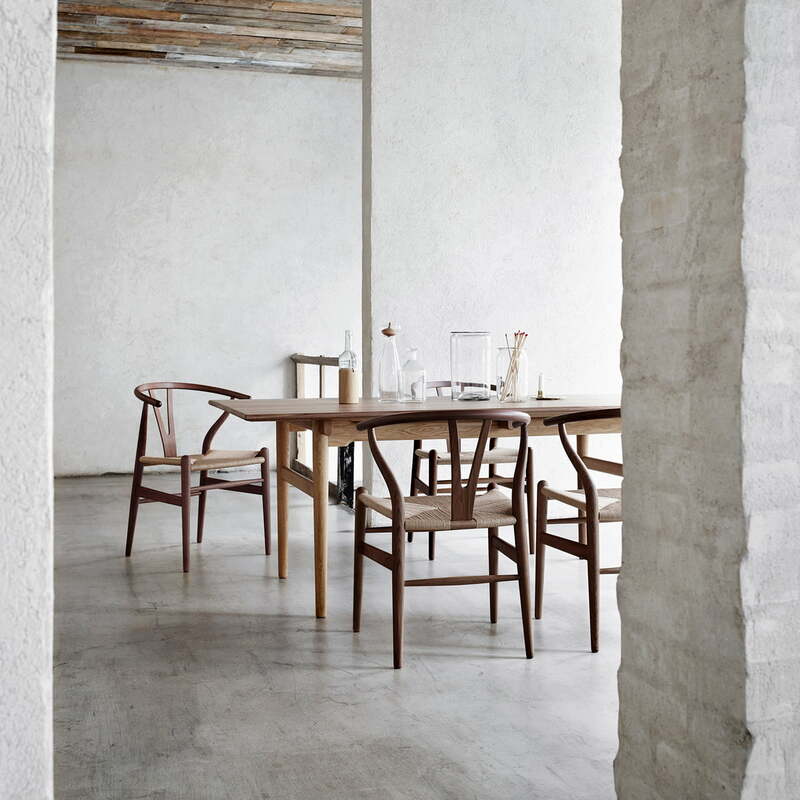 Together with the Elbow chair by Carl Hansen, a cosy place to eat with friends and family is made possible. Lifestyle product image of the Carl Hansen - CH327 extendable dining table. Together with the Wishbone chairs, a cosy and modern dining area is created. 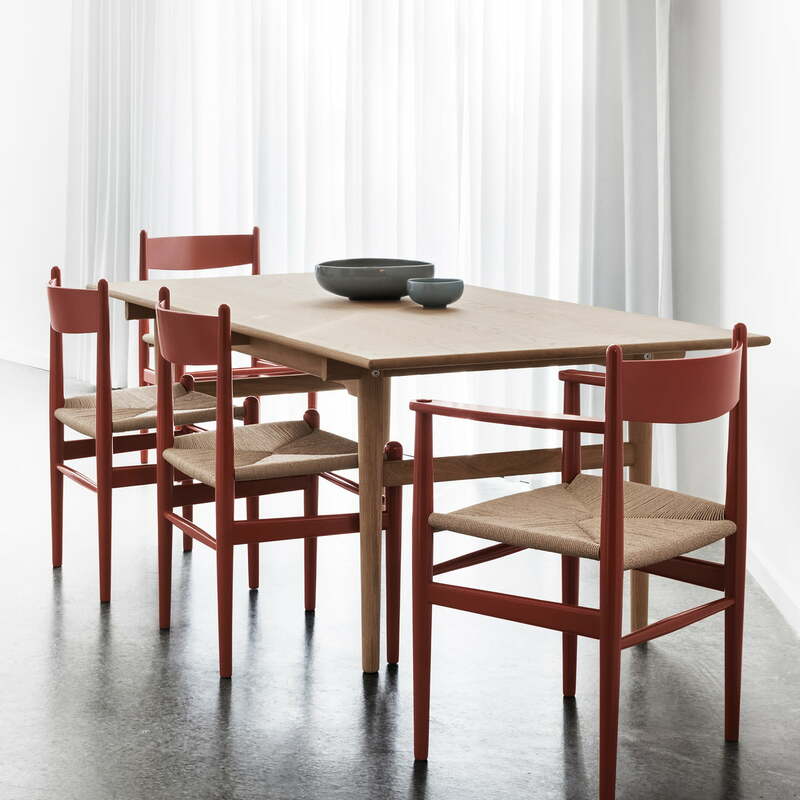 Lifestyle product image of the Carl Hansen - CH327 extendable dining table with chairs. The stylish table offers space for friends and families to dine together.